What we choose to eat makes a powerful statement about our ethics and our view of the world -- about our very humanity. Whenever we choose not to buy meat, eggs and dairy products, we withdraw our support from cruelty to animals, undertake an economic boycott of animal farms, and support the production of cruelty-free foods. Regardless of any other beliefs we hold, and however else we choose to live our lives, each of us can decide to act with kindness and compassion. Learn more about the benefits of vegan living and find out how it will help you, the environment, starving people, and of course, the animals. For an excellent introduction to vegan living, see the Vegan Starter Kit and the Vegan Guides. Share Our Work by distributing our literature or by adding links to our online resources in your email signature line. Your support saves lives! By making a contribution today, you can help Peaceful Prairie Sanctuary rescue more farmed animals and move closer each day to a more humane future. Your donations support media outreach, public awareness and humane education projects, and direct rescue and shelter efforts for abused farmed animals. Your help gives hope and compassion to suffering animals. Please be sure to check with your employer's Human Resources department to see if your company participates in a Matching Funds program! Introducing GoodShop and iGive as great new ways to support Peaceful Prairie Sanctuary! GoodShop.com and iGive.com are online stores created for the community-minded shopper, offering more than a million bestselling products including books, movies, music, electronics, housewares, gifts and more. Every purchase generates a substantial donation to Peaceful Prairie Sanctuary – an amazing average of 16% of store sales, sometimes as high as 33%. GoodShop and iGive have great products, great service, and great prices – the only difference between these stores and other major online retailers is that every purchase earns money for our organization. Check them out today, and if you decide to buy, remember that Peaceful Prairie Sanctuary will earn significant funds in support of our mission! This critical account is what gets us going day after day. It is the lifeblood of the sanctuary. These funds keep everyone fed, housed, happy and healthy. They also support our critical education and outreach on behalf of billions of farmed animals who are not lucky enough to call PPS home. Thanks to many generous donors, we are up to $5,000, but need at least another $10,000 to be able to purchase the base model of a much needed tractor for the sanctuary. Your donations in memory of your beloved family members and friends will help our work on behalf of the animals at the sanctuary, and the billions more who will never know the meaning of home. Your memorial tributes may be sent via email or regular mail to the address above. They will be added to the Sherman Memorial Fund section of the website. Founded by a long time PPS supporter who wishes to remain anonymous, but is deeply committed to the long-term financial stability of PPS. Contributions are requested in increments of $1,000. Help us meet the rising costs of food, shelter, supplies, and veterinary bills for our growing family of rescued residents. 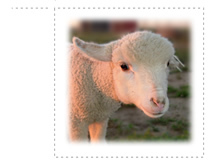 Please consider Sponsoring an Animal for one year. The sponsorship fees below reflect a portion of the annual costs annual costs to care for these deserving animals. Visitors and Volunteers are welcome on weekends, but *must be scheduled and confirmed* in advance. Please email tours@peacefulprairie.org if you wish to schedule a sanctuary tour or to volunteer. The sanctuary is not open for "drop-ins". We have a full work schedule every day and are not able to accommodate visitors during the week, unless otherwise scheduled. Join our email list, and follow our Facebook page, for updates. Organize a House Party for the Animals. Invite your friends to bring their friends for an afternoon or evening of delicious vegan food and good company! Are you a Rock Star? A Great Performer? Consider giving a benefit show and donating the proceeds to the animals of Peaceful Prairie.